Do you have a musician in the family? 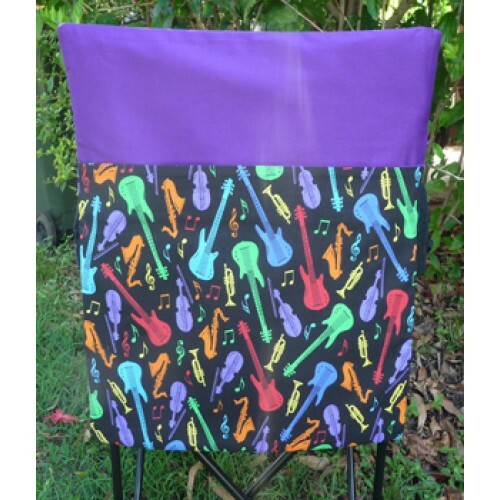 This School Chair Bag from Pink Petunias would make the perfect choice featuring guitars, saxaphones, trumpets and violins in vibrant colours of red, green, orange, yellow, blue and purple. Makes a great storage solution whether at school, home or camping. Made from durable 100% cotton fabric these bags are fully lined which makes them very strong. Machine washable in cold water. Designed to fit straight backed school chairs. Design: Vibrant coloured musical instruments on purple. Pattern placement may vary.